So many people these days are heralding the virtues of virtuous eating, snapping pics for their Instagram accounts and Twitter feeds depicting what’s on their plates and making you feel oh so guilty about whatever is on yours. Which, if you’re like the majority of the country, likely includes some type of meat. Vegetarian food has long been known for being less than satisfying or inspiring when it comes to taste, texture and flavor — not to mention substance — so naturally enough, going the vegged-out route comes with its fair share of skepticism. We, the carnivorous majority, eye the meatless plates before us, and wonder how we could follow the garden path without feeling like we’re missing out. But isn’t it all just a mind game? We’re so accustomed to what we’re familiar with that the alternative seems impossible. But the truth is that various meatless options provide flavors, textures and nutrients that match or exceed those offered by traditional diets. Even if grudgingly at first, die-hard lovers of meat are taking a cue from the vegetarian and gladly forking up something new. Veggie choices range from noodles made from spiralized vegetables to meatless burgers made from beans and quinoa. And whether or not you can actually pronounce the ingredient you’re using without the help of a pronunciation key, the fact remains that going vegetarian — even if it’s only once in awhile — doesn’t have to feel like a punishment. It can be an adventure for your tastebuds that takes your health along for the ride. And, despite what you might think, it truly is something you can easily do at home without the need for intimidatingly complex cooking methods or a laundry list of unfamiliar ingredients. The main thing to focus on is the quality and the seasonality of what you’re putting in your cart at the grocery store or at the farmer’s market, and then building on the inherent flavors with complementary spices and sauces. 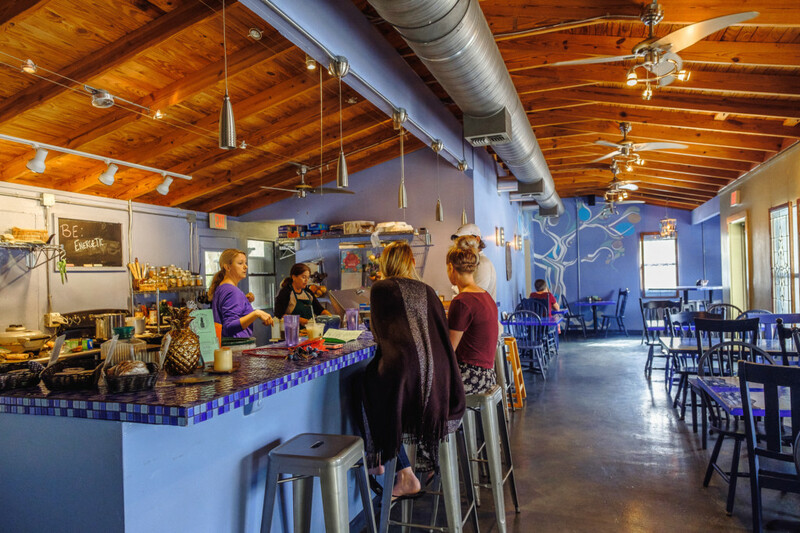 “Ideally, you want organic vegetables that are grown in good, healthy soil that’s rich in minerals and are non-GMO,” says Karin Frisbee, a pediatric chiropractor who co-owns and operates Organic Café in Fort Walton Beach with her husband and fellow practitioner, Ed Frisbee. Both doctors focus intensely on healthful eating and the effects it has on the body, and their love of abundant flavor is something that — even in their healthiest menu options — is something that’s never left out of the equation. Creativity is key to a successful vegetarian dish, and Ric Kindle is serving just that in every colorful soup, salad and appetizer he offers on the menu at Live Juice Bar and More in Pensacola. Having been a passionate vegetarian for more than 20 years, Kindle has learned all the tricks of the trade, and it shows in the food he’s created, regardless of whether you stop in for a juice or porridge at breakfast or satisfy a dinnertime craving for nachos. Clearly, he’s willing to think outside of the box, using a variety of ingredients that aren’t always what they seem — but, boy, do they deliver on taste. “Most people don’t realize that cashews can be made into cheese or that flax meal serves as a great substitute for eggs,” Kindle offers, citing veggie-based alternatives that can be easily found at most grocery stores. Given the proven health benefits of going “veggified” — even if only once a week — there is good reason to take the leap. You’ll never even know what your plate is missing.